The Blue Ridge Parkway really needs no introduction. It's one of the most famous adventure corridors in the entire Southeast. Winding 469-miles along the weathered escarpment of the Blue Ridge Mountains from the Smokies to the Shenandoah, it's a road that offers up an essentially endless supply of outdoor activities and photo-worthy pull-offs. And while the parkway is perhaps best known for it’s driving qualities, the hiking along the way is equally spectacular. Here are seven hikes worth stopping for. 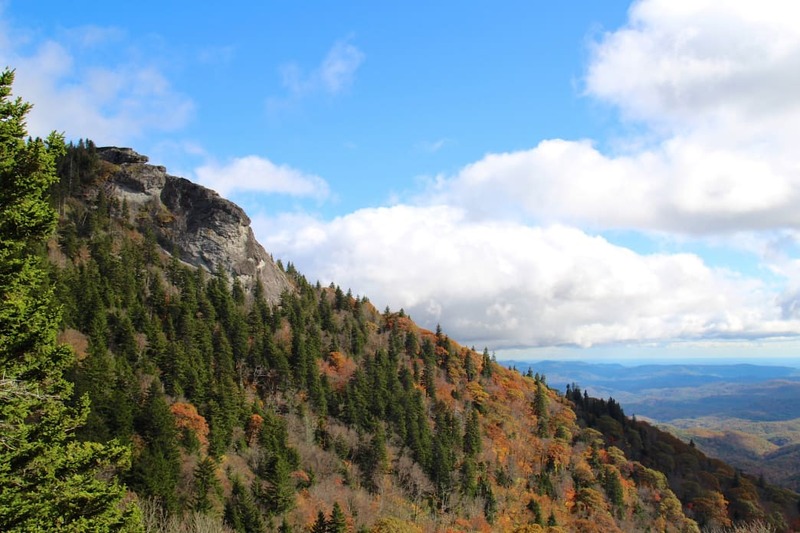 The shortest hike on the list, Devil's Courthouse is probably considered more of a jaunt than a hike. Only a half-mile to the summit of The Courthouse itself, it's far from a strenuous trek, even if it is mostly uphill. And the views that unravel from the top are some of the best you'll find in Western Carolina. Don’t let the deadly name fool you: Graveyard Fields is bursting with life and color. One of the more popular spots along the parkway, the area is often full of visitors, but it's easy to see why, as it's littered with waterfalls, swimming holes, and wild blueberries. To hike, follow the trail down into the valley and cross the river. Turn right for a short trip to Second Falls, or take the trail left to Upper Falls. Stay on the path until it drops you at the base of Upper Falls. You can take the same trail out or spur to the right to complete a loop. Great views will greet you from the summit of Mount Pisgah, just be prepared to climb to get there. You’ll gain 750 feet in a mile and a half, with most of the elevation gain coming in the second half of the climb. Wear appropriate footwear, as the trail is rocky and full of twisted roots. A transmission tower sits at the summit, so don’t expect a wilderness peak, but the surrounding views make up for it. On a clear day, you’ll be able to see the Great Smoky Mountains, Asheville, and Mount Mitchell. The Blue Ridge Parkway provides prime access points to a number of sections of the 1,150-mile Mountains-to-Sea-Trail. The trail, which stretches across North Carolina, encompasses a variety of landscapes and weaves over soaring open ridges and through the dense green tunnels alike. From the parkway, hikers can jump on and follow for as long or short as desired. The Waterrock Knob overlook at BRP Milepost 451.2 is an especially scenic spot worth checking out. 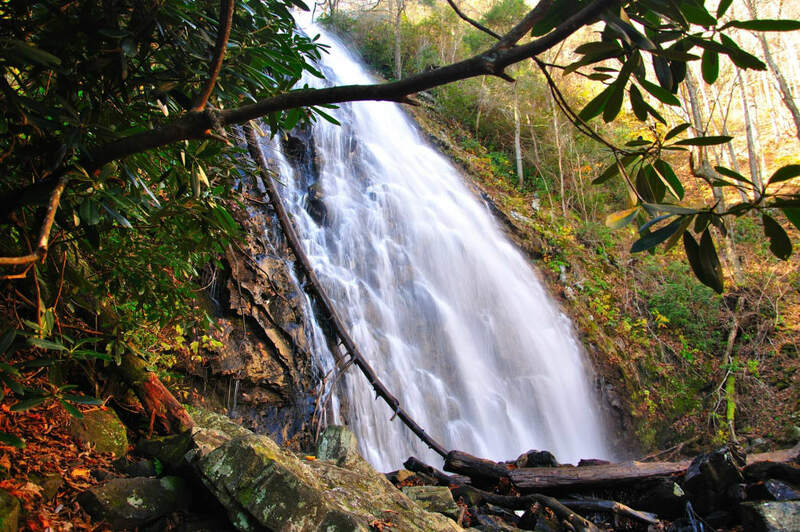 Hikers have two options to reach Crabtree Falls: a 3-mile out and back trek or a harder 3.5-mile loop. Both provide access to the falls, with the loop taking you to a ridge above as it heads back to the parking lot. The falls themselves are an impressive 70 foot drop. In spring and summer, wildflowers bloom along the way, while in fall the woods come to life with the spectacular colors that Western North Carolina is famous for. 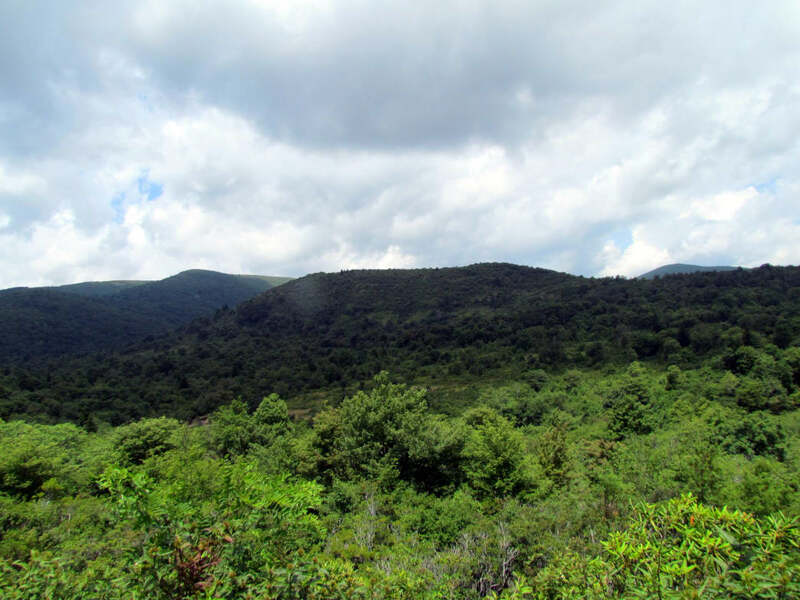 The Green Knob/Sims Creek Trail is a short loop in Julian Price Memorial Park that crosses creeks, travels through wildflower-filled meadows, and offers up spectacular views of Grandfather Mountain at various sections along the way. One of the lesser-known trails along the parkway, it's a great place to find some solitude that's not always easy to come by on the parkway. What it may lack in sweeping panoramas, it more than makes up for with subtle beauty and easy hiking. Trail runners would especially enjoy this trail, as it's far from technical terrain. 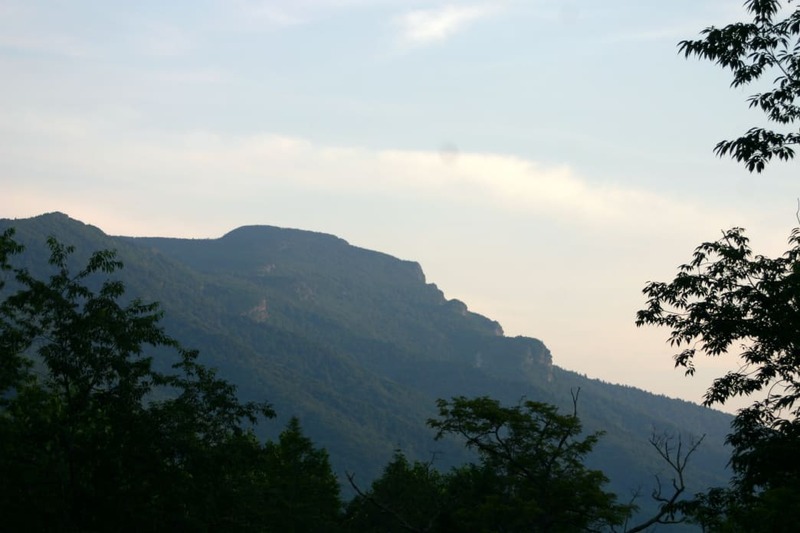 Named after the Cherokee word meaning "fabulous hawk or eagle", this spectacular trail crosses Grandfather Mountain and is perfect for anyone looking for a longer day hike option. Winding through a variety of landscapes—think boulder fields, rhododendron thickets, and evergreen glens—the trail is not lacking in diversity, and the photo opportunities abound. The moderate hike can be shortened by exiting at the many parkway access points, or lengthened if you take it there and back. 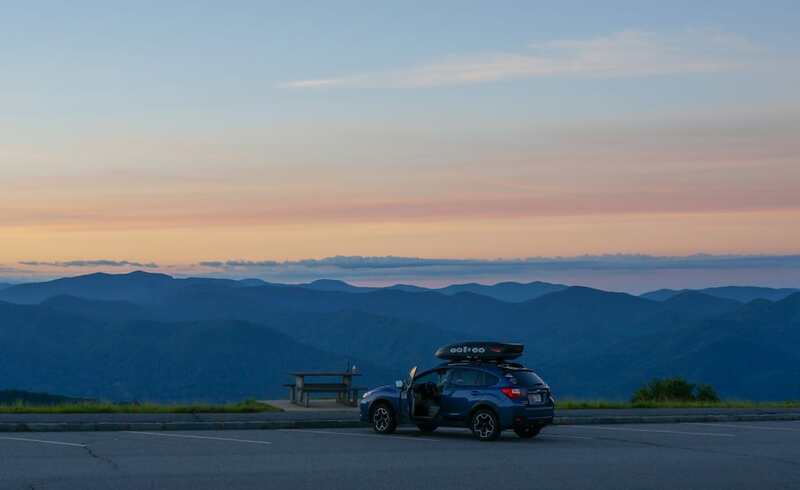 Whether you’re looking for a tough hike or quick run up an overlook, the Blue Ridge Parkway is the languid, ribbony access point you’re looking for. Not to mention the drive along it really can’t be beat. The next time you’re in Western North Carolina, be sure to stop the car and explore: You just may find your new favorite place to hike. Written by Julia Bonney for RootsRated.